...hello to a friend I thought I would make a card and post it to them. This uses a new DigiStamp Boutique image and layout 311 from Sketch Saturday. Another Christmas card. This time using a DigiStamp Boutique sentiment and sketch 299 from Sketch Saturday. I know someone who loves purple.... when I saw that this weeks twist for Sweet Sketch Wednesday was purple I thought that would be good. I quite like purple too. However, today I realised that I hardly have any purple papers in my stash. These are the only ones! I have used a Pollycraft image on this card and will also enter it into this weeks Little Miss Muffet (anything goes), Passion for Promarkers (pearls and pins) and I Love Promarkers (flowers). This months Rudolph challenge on the Purple clubhouse was set by Clare and it was to pick out elements on two cards that she made and incorporate them into your own card. I have taken the blue, sentiment focal point and cas design for my card. 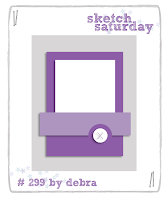 It uses a Bugaboo image and sketch layout 306 from Sketch Saturday. I will enter this card into this weeks Little Miss Muffet (anything goes) and Cute Card Thursday (blue) challenges. Ever started off making one card and it change into something completely different? That's what happened with this one. I quite like the end result though. I used a DigiStamp Boutique image I have had for a while and never printed before (plus sentiment from there too). I will enter this card into this weeks I love Promarkers and Little Miss Muffet (anything goes) challenges. Thought I would make a card to go along with the elephant that I crocheted a week or so ago as a thankyou. 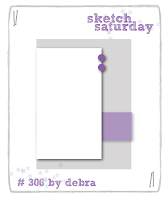 This uses a DigiStamp Boutique image and an old sketch from Sweet Sketch Wednesday 2. I will enter the card into this weeks Passion for Promarkers (diecuts) and I love Promarkers (anything goes) challenges. I think I have only used this DigiStamp Boutique image once before and since it is a sunny day it had to come out again. I will enter the card into this weeks Sketch Saturday (sketch), Little Miss Muffet (buttons) and I love Promarkers (weather) challenges. Another DigiStamp Boutique image that I have rarely used. I will enter this card into this weeks Sweet Sketch Wednesday (sketch) and Passion for Promarkers (no sentiment) challenges. Hard to photograph this one without it being worn and so I used a ball of wool as my 'model'. I have had this Pollycraft image for a long time and not used it until the other day. I always think she is looking into the distance, thinking about things. I will enter the card into this weeks Stamplorations challenge. A card I made on Monday I think, using a newly released DigiStamp Boutique image. The card follows this months Mojo Monday sketch. I printed off this image last week but had a bit of a light bulb moment this morning when I decided what to do with it. It looked good at the time (in my head) with less embellies on a big card. I still think it kind of works. The temptation to add more is still there but I don't think I will. The card uses a DigiStamp Boutique image and this weeks Sketch Saturday layout. The other day DigiStamp Boutique released a new 'travel' digi set. I just knew that I had to buy it. It includes all those type of sentiments that you need but can never find at the right time. I love the cute little images too. I made these two cards using this weeks Retro Sketches layout. This months Stamplorations challenge is 'flowers and stamps'. For some reason I usually feel the need to get a bit more 'arty' with this challenge and step away from the digis. I had a bit of an experiment today. Does it work? I'm not sure. Not a complete disaster though, I don't think. Another using the birdie set recently released by DigiStamp Boutique. I did try to follow the sketch from this weeks Mojo Monday challenge on this, but it seemed to pass me by that the whole thing was meant to be 'tall and slim'. Nevermind, I will enter the card into this weeks Di's digi challenge (birthdays). Another image I bought from DigiStamp Boutique last autumn and not had a chance to print and colour until now. I really like this penguin set- aren't they cuties? I will enter the card into this weeks ABC Christmas (I is for Ice) and I love Promarkers (not quite straight- I think all my cards fall into that category- lol!) challenges. After buying the birdie set from DigiStamp Boutique I want to print and colour them all :-) Hence another card this week using one of the images. I will enter this card into this weeks Sweet Sketch Wednesday (sketch + flower, patterned paper and sentiment) and Passion for Promarkers (get well soon) challenges. When I saw the pattern for this hat in my book I knew that I just had to make it. Originally it didn't have a potential owner- just a project to do 'cos I wanted to. However, Mum walked in on me knitting the other day and said she wanted it. (Mum wasn't wearing her glasses at the time and thought it was a mouse!) Now it is finished it does look good on Mum (even if she doesn't think so!). I am assured that it will be worn when they go on holiday to Canada at the end of the year (where it will be cold). If I make the hat again for a female I would decrease the pattern a little- it is really too big for me and Mum. I should also make another pompom for one of the platted earflaps as it went a bit wrong... how hard can it be to make a pompom? Too difficult for me obviously!